This is not my ordinary blog. Today, we commemorate D-Day. It was the Allied attack on the European continent beginning at the beaches of Normandy, France, that led to the end of the worst armed conflict ever on our planet. On this very day, 70 years ago, the armed forces from Great Britain, the United States, Canada, and other nations landed on the beaches of Normandy. I had the high privilege of being in Belgium last Sunday and spent some time contemplating what happened and paying respect to the brave men and women of the military that fought here. My memories of the aftermath of WW War II are still vivid. My Father was a sergeant in the U.S. army and my Father in Law served in the European theatre for the United States. I know both were affected by the war…but I will probably not know just how much until I greet them again in the after life. May God bless them and Millions of others for their brave service. While in London, Brussels, and Ypres last week, here are some interesting things I learned about D-Day and other aspects of World Wars I and II. First, why is it called D-Day? Some believe it was Doomsday or Decision Day but in reality the designation was simply referred to as THE DAY. In other words, the day before June 6, 1944 was known as D minus 1 and the days after were D plus 1; D plus 2 etc. D-day was the largest amphibious invasion in history, with more than 4,000 ships, 11,000 warplanes and 156,000 Allied troops. More than 4,400 Allied troops died that day. Half of those landing at Normandy on D-Day were Americans. Within five days, 200,000 more troops had landed at Normandy. By the end of June, the number of Allied troops landed at Normandy had climbed to 850,000 and to more than a million by July 4. According to Wikipedia, World War II was the deadliest military conflict in the history of the world. In total, over 60 million people were killed, which was over 2.5% of the world population. It was really an amazing deception that led to the success of D-Day. The Germans and their partners were led to believe that the Allied forces would be attacking at the City of Calais in France on the border of Belgium which is the nearest spot on the Continent to Great Britain. However, for over one year prior to this, the Allied forces made specific plans to land 200 miles to the West on the vast expanse of the beaches of Normandy. This deception was known as Operation BodyGuard. Operation Bodyguard was the overall Allied deception stratagem for the Normandy landings. A subset of Operation Bodyguard was Operation Fortitude which was created to ensure the Germans would not increase troop presence in Normandy by promoting the appearance that the Allied forces would attack in Calais. As part of Operation Fortitude, the United States invented an entire new field army. The First United States Army Group (FUSAG) was a skeleton formation formed for administrative purposed, but never used. However, the Germans had discovered its existence through radio intercepts and believed the FUSAG would be attacking Calais. The first American to make it to Normandy was Captain Frank Lillyman. He parachuted in, was wounded later in the day, and won the Medal of Valor. Amazingly, this hero, served the U.S. Military until 1968, retiring at the rank of Lt. Colonel. He died three years later. General Theodore Roosevelt, son of U.S. President Teddy Roosevelt, led the landings at Utah Beach in Normandy, winning the Medal of Honor. A week after D-Day, he suffered a heart attack during a battle and died. He is buried in Normandy. Ultimately the brilliant success of D-Day was due to great strategy but also to incredible bravery as well. The Seas of the English channel were the most windy and rough they had been in 20 years. The crossing was extremely difficult for our soldiers, many of whom became ill in the rough seas but it was this very fact that the landing was successful. The Germans believed that there was no way that Allied forces could land anywhere on the continent due to the adverse weather conditions. “June, 1944 saw the highest winds and roughest seas experienced in the English Channel in June for twenty years…. As mentioned above, I had an extraordinary week for business with meetings ranging from NYC to London culminating with a keynote speech delivered in Brussels. 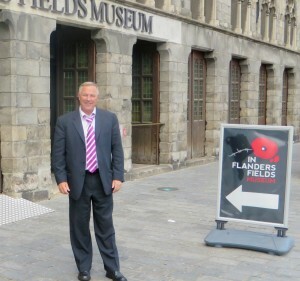 But the thing that will live forever in my memory was my visit to the village of Ypres located in Northwestern Belgium. Our ability to live free lives was hugely affected by what happened in Ypres. Let me explain. The City of Ypres is located in the Flanders region of the Northern part of Belgium about 30 miles south of the English channel. Flanders is the Dutch speaking region in northern Belgium. The Southern part of Belgium is French-speaking. It’s estimated that beneath about 50 square miles in the area around Ypres, there rest over a Million bodies of the brave soldiers representing Belgian and American, French and Canadian, British and Australian, German and Italian, etc. These are also known as “Flanders Fields.” The town of Ypres was the site of three major battles that turned the tide during WWI. Ypres was a key battleground because it was strategic in preventing the Germans from reaching the English Channel. The first battle of Ypres occurred in the Fall of 1914. British, French, and Belgian Troops were outnumbered by the Germans. The Allies won the battle after 34 days. It began what has become known as trench warfare. The second battle of Ypres in 1915 introduced the horrors of chemical warfare into armed conflict when the Germans used poisonous Chlorine Gas. 60,000 Allied troops were killed by the Germans using this and other means. The Third battle took place between July and November of 1917. The fields of Flanders were turned into a muddy swamp – almost impossible to cross due to the heavy rains that fell during the conflict. 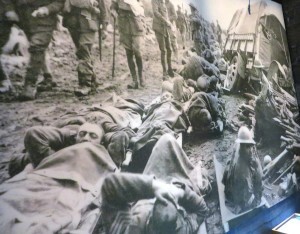 The Germans, who were in concrete bunkers, killed a massive number of Allied troops with mustard gas and machine guns. Sadly, the casualties totaled 250,000 soldiers for each side! The poem that became synonymous with World War I, “In Flander’s Fields,” was written just after the second battle of Ypres by Canadian physician John McCrae. He wrote the poem in May of 1915 after presiding over the funeral of a close friend and fellow soldier, Alexis Helmer, who died in the conflict. 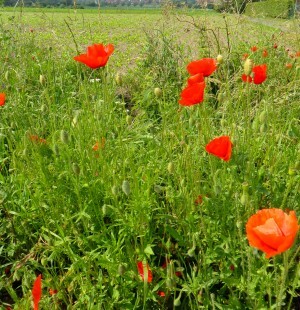 The poppies referred to in the poem grow in profusion in Flanders in the disturbed earth of the battlefields and cemeteries where war casualties were buried. It is my personal wish that this day and always, we shall not forget those who bravely died to preserve our freedoms. We have so much to be grateful for. Those who died in Flanders Fields and on the beaches of Normandy should be at the top of that list. Many or my family members, men & women fought in WW1 & WW11. I am grateful to them for our freedoms. Prior to the Normandy invasion, the Allies tried to invade Dunkirk, France. After landing, large numbers of Allied troops were cut off & surrounded by the Germans. There was no other option other than retreat back to the beaches. 338,226 soldiers were rescued by a hastily-assembled fleet of over 800 British Fishing boats, small tugs, all went to the aid to bring the troops back to England. Churchill called it a “miracle of deliverance”. What an incredible example of fortitude & unconditional love. Thank you for the message. I too remember and appreciate those who served in the wars. Killing levels were so high in WWI and WWII…and the righteous, virtuous, and innocent were not necessarily spared. I’m glad God will be the judge. Thanks for sharing your journey of gratitude. My oldest son David has love and adoration for all who have given their lives that we might be free. He celebrates all of the days of remembrance every year. He sent a text picture of Normandy to me today.